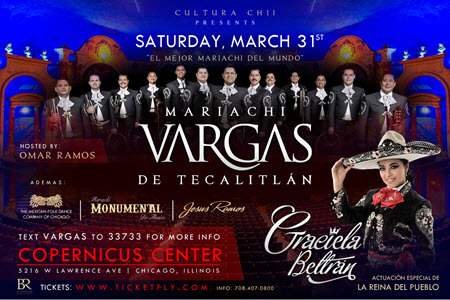 World-renowned Mariachi Vargas de Tecalitlan returns to Chicago Saturday March 31, 2018. Celebrated as “The Greatest Mariachi in The World” the hailed ensemble showcases the select tradition of Mexican folk music. With a sound that transports itself across borders, Mariachi Vargas de Tecalitlan fascinates the audience more than ever before.